Small Unit: Up to 350 sq. ft.
Large Unit: Up to 750 sq. ft.
Multi-Room Unit: Up to 1500 sq. ft. The revolutionary new Airwise&REG; Purifier is based on advanced technology that goes beyond mechanical filtration methods like high-efficiency particulate air (HEPA) and other methods like electrostatic filtration, ozone, ultraviolet light and ionizers. At the same time, it settles dust and other large particles out of the air and destroys microorganisms like bacteria and viruses. So, why settle for stick (grid) units or noisy fan machines? Air that is is not exchanged (passed through) those units is never purified! Airwise uses photocatalysis, a purification process so effective its FDA approved for poultry processing (destroys salmonella), pork processing (destroys E. coli). The photocatalysis purification process is also widely used to remove pesticides from fruits and vegetables. It not only kills bacterial cells, but also decomposes the cell itself. It has been tested in both medical and industrial settings, and has proven successful at eliminating odors and impurities caused by chemicals, viruses, and bacteria. 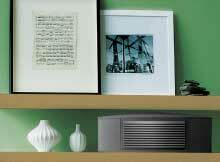 Airwise creates inductive warmth, drawing humidity into the purifier. 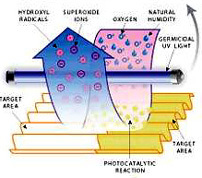 When humidified air enters the target area, a photocatalytic reaction occurs and superoxide ions and hydroxyl radicals are created. Developed at the Univesity of Florida, the photocatalytic air filtration system has been tested in medical and industrial settings and already has proven successful at zapping odors and impurities caused by chemicals and bacteria. The system uses ultraviolet light rays , which react with a titanium dioxide-based chemical catalyst which air passes through. The result is oxidation, which attacks and destroys microbes by disintegrating their DNA. The reaction also kills dust mites and mold. With this system, contaminants are destroyed rather than transferred. No toxic chemicals are employed. Photocatalysis is equally effective for purifying the air in your home and workplace. Use it where people typically gather to help prevent the spread of colds, flu and other illnesses. This innovative air treatment technology is designed for continuous use so that you are guaranteed pollutant-free air. As an added benefit, positively charged indoor pollutants are treated by the WisePointe technology which generates active negative ions at an accelerated rate, thereby enhancing the speed at which dust and other airborne particles are dropped out of your breathing space. Airwise technology works outside of the box so it is not necessary for polluted air to actually enter the purifier. This process significantly reduces allergens such as pollen, pet dander, dust and smoke; and it destroys viruses, bacteria, mold and mildew. Airwise needs no fan, so it's as quiet as a light bulb; and it has no grid or filter, so it requires no cleaning or filter replacement. All you do is replace the photocatalytic lamp module once a year (no tools required).